Moderated by Michael Riley (left), editor-in-chief of “The Chronicle of Higher Education,” the panel featured (from right) Ralph Cicerone, president of the National Academy of Sciences and former UC Irvine chancellor; James E.K. Hildreth, president of Meharry Medical College; Maria Klawe, president of Harvey Mudd College; and UC Irvine Chancellor Howard Gillman. In 1965, the campus of the future rose from a muddy cattle ranch south of Los Angeles. The University of California, Irvine – one of three authorized by state regents to educate a burgeoning population of bright young people – was funded with tax dollars spent to hire the finest faculty and build state-of-the-art classrooms and laboratories designed by the nation’s leading urban planners. Tuition for students from the Golden State? Zero. Fast-forward half a century. UC Irvine has gone on to win three Nobel Prizes and rank No. 1 among young U.S. universities. But the headlines today tell a different story about higher education overall, both in California and across the nation. Faced with sharp cuts in state funding, many campuses are fighting to survive or expand. Less than a third of college professors are tenured, and the average student owes tens of thousands of dollars upon graduation. So what is the future of higher education? 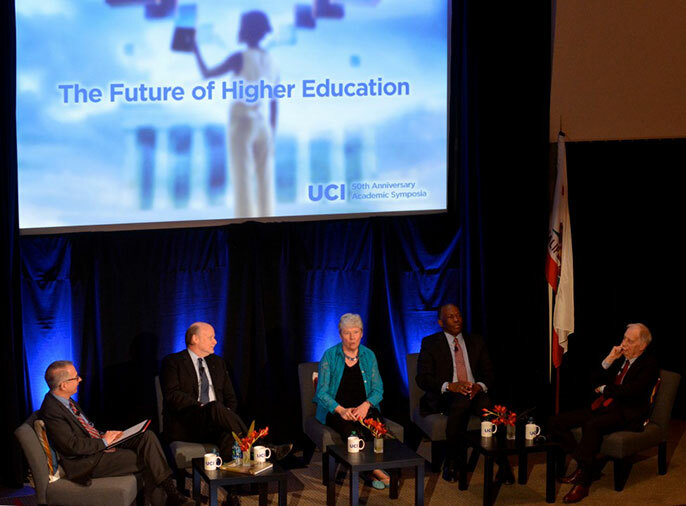 On Feb. 26, at the signature event of UC Irvine's 50th Anniversary Academic Symposia, Chancellor Howard Gillman and fellow academic leaders held a thought-provoking conversation about the path forward for American campuses. Moderated by Michael Riley, editor-in-chief of The Chronicle of Higher Education, the panel also boasted Ralph Cicerone, president of the National Academy of Sciences and former UC Irvine chancellor; James E.K. Hildreth, president of Meharry Medical College; and Maria Klawe, president of Harvey Mudd College. All agreed that every qualified American who wants to attend college, regardless of background, should still be afforded the chance to do so. But Gillman and some in the audience argued that it’s foolhardy to expect strapped legislatures to ever again completely fund tuition, research laboratories and campus growth. "Campuses need to find new partners to support their mission"
UC Irvine trustee Chuck Martin argued that campuses need to think in terms of productivity, more like corporations. But Cicerone countered that abandoning the push for public funding is wrong. The exchange was part of a lively discussion at the Arnold & Mabel Beckman Center of the National Academies of Sciences & Engineering. Along with access and diversity, topics included tenure, academic freedom, better balancing teaching and research, new technology and other critical issues for campuses of the 21st century. Hildreth said that as a minority student at Harvard University in the 1970s, he and his peers who experienced racism banded together at self-created “black tables” in dining halls to support each other. But they didn’t bother to speak out because they believed no one was listening. Today, he said, such students can document offensive images and discuss negative experiences online before a worldwide audience. James E.K. Hildreth (right) and Maria Klawe (left). A medical doctor who works to eradicate AIDS and other diseases, Hildreth said neither he nor his fellow panelists could know what campuses 50 years hence will look like, but they will be curating young people making use of powerful new learning tools. He also described “savoring” the sight of 1,300 freshmen of every background talking happily to each other before the start of a class. “We’re all 99.99 percent the same genome,” he noted. A computer scientist who has worked for gender equality, Klawe also discussed costs and business partners. She said “co-op” programs like those in Canada should be more widely implemented in the U.S., with businesses employing students for a year during their college studies. Cicerone agreed but said continued funding of basic university research was vital. He and Hildreth said they’d seen students who failed in class blossom in a team laboratory setting with a professor. They stated that employers greatly prefer students who have research and team-building experience. Cicerone also noted that research by public universities in particular leads to better human health, environmental protection, product development and national security. “We’re forgetting about the public good,” he said. “In fact, I’m going to make the strong claim that the entire American experiment is in jeopardy” because of sharply declining taxpayer support. Klawe said she wanted to “push back” against placing such emphasis on research. There needs to be a better balance between teaching and research, with instruction given more due, she said. If she had to decide between funding a successful Zika virus vaccine and training hundreds of students to become the next generation of vaccine researchers, she’d choose the latter, Klawe said. “I’d like to see both,” Hildreth replied. Gillman said that while legislative support for in-state tuition was critical, getting help from private supporters in the community was a better way to fund research and new buildings for the future. He pointed to visionary Orange County philanthropists Sue and Bill Gross, who recently pledged to UC Irvine $40 million to create a world-class nursing school. They acted after state officials were forced to abandon promises to fund the program. In interviews, several UC Irvine higher education experts weighed in as well. Targeting "students of the future"
For UC Irvine Chancellor’s Postdoctoral Fellow Constance Iloh, what’s important is recognizing and serving the “post-traditional” older adult and working students of the 21st century, as well as nonwhites at both liberal arts and for-profit colleges and children of immigrants who are the first in their families to attend college. UC Irvine has achieved a unique distinction when it comes to so-called “first-generation” students and research universities, said Anita Casavantes Bradford, associate professor of history and Chicano/Latino studies. More than 60 percent of its undergraduates have parents who didn’t earn a college degree. UC Irvine is also the youngest member of the prestigious American Association of Universities and has been ranked the top U.S. university under 50 years old for the past four years. The daughter of a single mother, she was the first in her family to earn a high school diploma and college degrees. She echoed Hildreth’s sense of isolation and recalled the exhaustion she felt while working to put herself through college. Research by Casavantes Bradford and others has shown that talented first-generation students can see their grades dip during the first semester because they’re unaccustomed to seeking help from professors, for instance, or feel lost in a new environment. UC Irvine faculty are now specially trained mentors for such students, and Casavantes Bradford and current undergraduates are creating a peer-to-peer mentoring program to ease what can be a tough transition. Gillman, the son of working-class San Fernando Valley parents who was also the first in his family to earn degrees, stressed that access is a key part of what makes UC Irvine great and must be maintained for future generations.